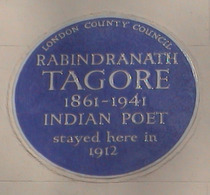 Rabindranath Tagore, 1861 - 1941, Indian poet, stayed here in 1912. Tagore rented the house for about 3 weeks or a few months (depending on source) on one of him many visits to Britain. 2017: There are plans to acquire this house and convert it into a museum-memorial. The (wooden) plaque adds two years to his life.